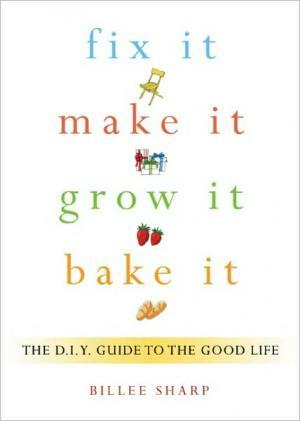 Fix It, Make It, Grow It, Bake It is packed full of just about as much information as the title suggests. The book is generally a fun and easy read, with crafting suggestions and healthy recipes. It is not, however, the bible I’d hoped it would be. While there are many recipes for making your own toilet bowl cleaner, there’s little helpful advice on things like how to garden. Rather, the focus is simply on the benefits of gardening. One of the great things about Fix It, Make It, Grow It, Bake It is that Billee Sharp is adept at making things most people would scoff at seem perfectly reasonable. For example, Sharp makes dumpster diving seem as viable an option as buying a chair off Craigslist—and not just for furniture. In the chapter entitled “Freeconomics,” Sharp gives suggestions for dumpster diving for food, organizing community programs that will help neighbors share their unwanted items in lieu of sending them to the dump, and twists on the tried and true clothing swap (which she has renamed “Naked Lady Parties”). There is one line in the book that tainted the rest of the read for me. In chapter four, “Homely Habits,” Sharp makes it clear that she’s not the best at wielding a wrench, which is fine. But then she writes that when her husband is out of town she keeps a roll of duct tape on hand because, “Even if I can’t fix stuff, I can hold it together with duct tape.” This is one of the least empowering things I’ve ever read, and coming from a book that claims to put power back into my hands, I found it to be pretty jarring. In addition to a little feminist boost, Fix It, Make It, Grow It, Bake It desperately needs an index. There is so much information about baking, fixing, and growing in order to save money in the chapter about finances, but one may never find some gem they hoped to reference without spending cash on post-its to mark the pages. If you’re a novice thrifter or a newbie to reducing, reusing, and recycling, Fix It, Make It, Grow It, Bake It will have more helpful hints than you'll know what to do with. But if you’ve fixed a chair or composted recently, there may not be a lot of new information here for you.